I’m so pleased to be partnering up again with American Yarns to bring you some fresh yarn reviews and original patterns over the coming months. 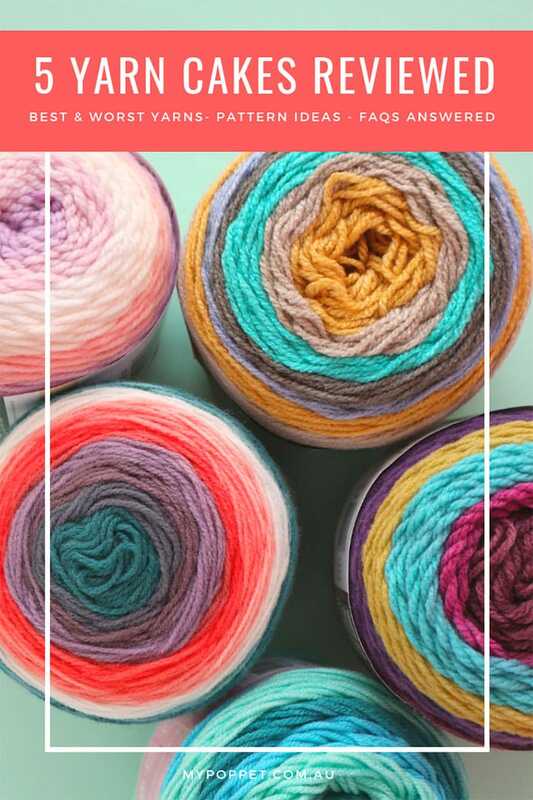 Today I’ve got a bumper post comparing their FIVE most popular brands of self-striping yarn cakes. 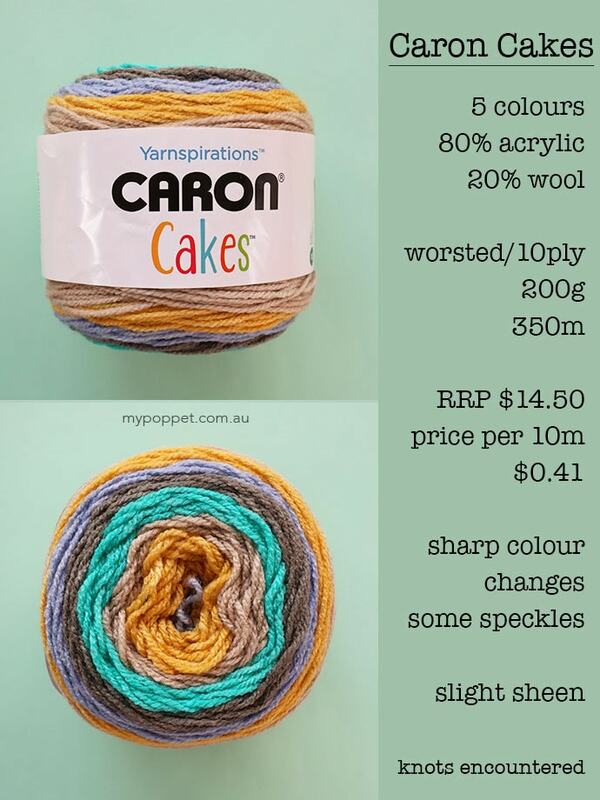 My original yarn cake review post comparing Caron Cakes and Sweet Roll cakes has been super popular with lots of questions, comments and feedback, so I thought it was time write a bigger and better post addressing every question you may have about yarn cakes. 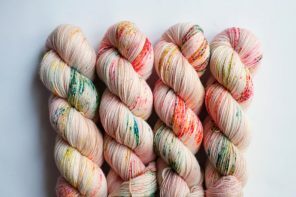 So firstly I thought I’d answers some frequently asked questions about self-striping yarn cakes that applies to nearly all the brands. Of course, if I’ve missed anything, just leave a question in the comment section and I’ll add it in. 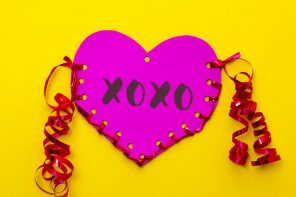 I’ll also be rounding up a list of patterns that work well made from yarn cakes at the end of this post. 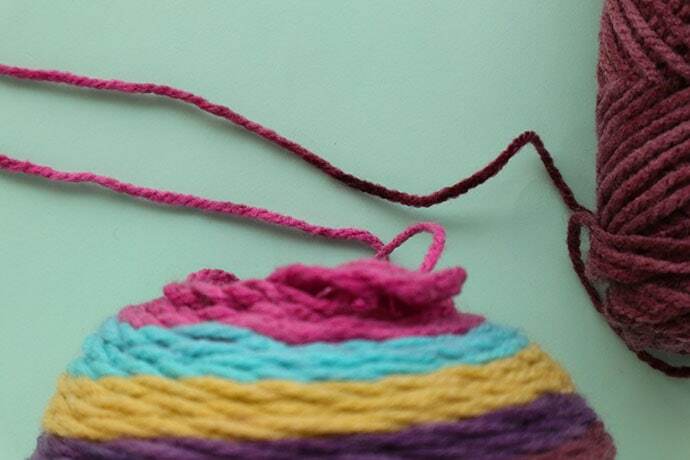 What is a Yarn Cake and how does it differ from a regular ball of yarn? A yarn cake is a yarn that is wound into a flat ‘cake’ shape with a flat top and bottom. 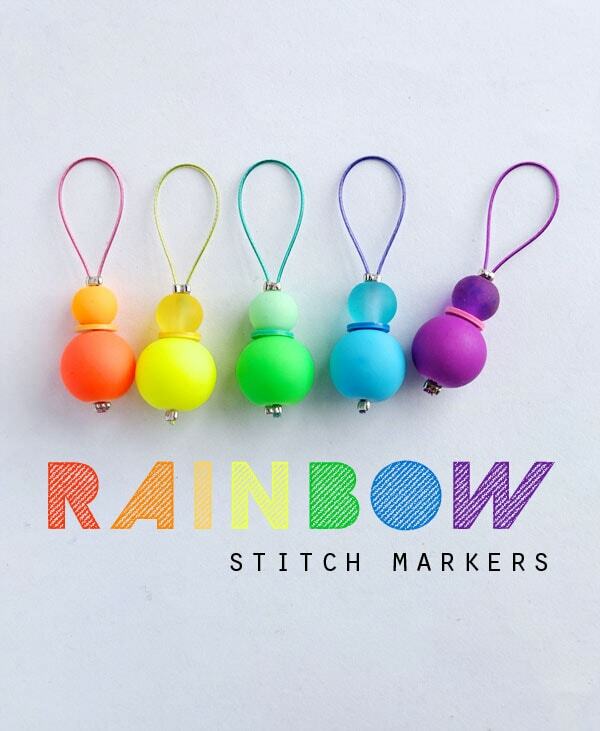 It’s designed to be used as a center-pull ball which is very convenient as it stops the yarn bundle moving or rolling around when knitting or crocheting. 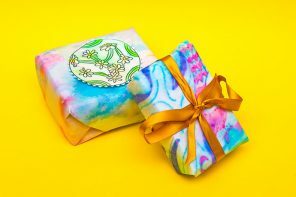 You can make your own yarn cake from any yarn with a ball winder, but in the case of the yarns features in this post, they already come pre-caked (I’ve just invented that term) from the manufacturer. Another attractive feature of yarn cakes is that is showcases colour changes in the yarns. 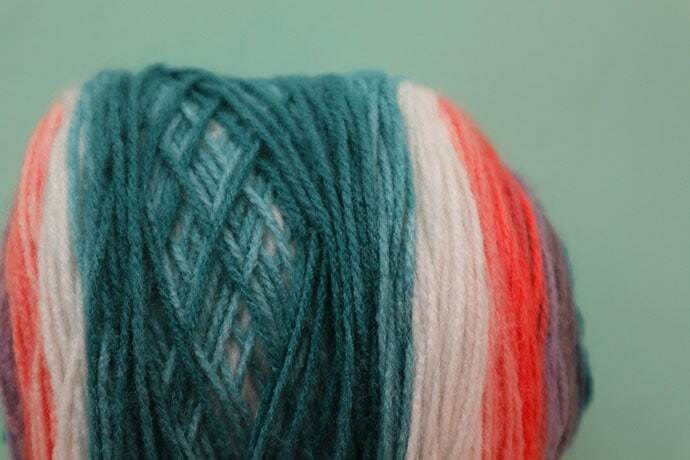 How do Self-Striping Yarn Cakes differ from Variegated yarns? Variegated yarns are yarns where the colour changes throughout the yarn. The length of the colour run will determine if a yarn will create stripes or not. Yarns with short colour changes with create splotchy pattern when worked up. Yarns with long colour changes will create stripes when worked up. The longer the length of each colour, the thicker the stripe. The thickness of the stripe will also depend on the width of the project, this is something to keep in mind when choosing a striping yarn. Some self-striping yarns have fairly abrupt colour changes which may be noticeable depending on where the change lands on the project. Others have subtle changes that blend from one colour to the other creating a gradient effect. 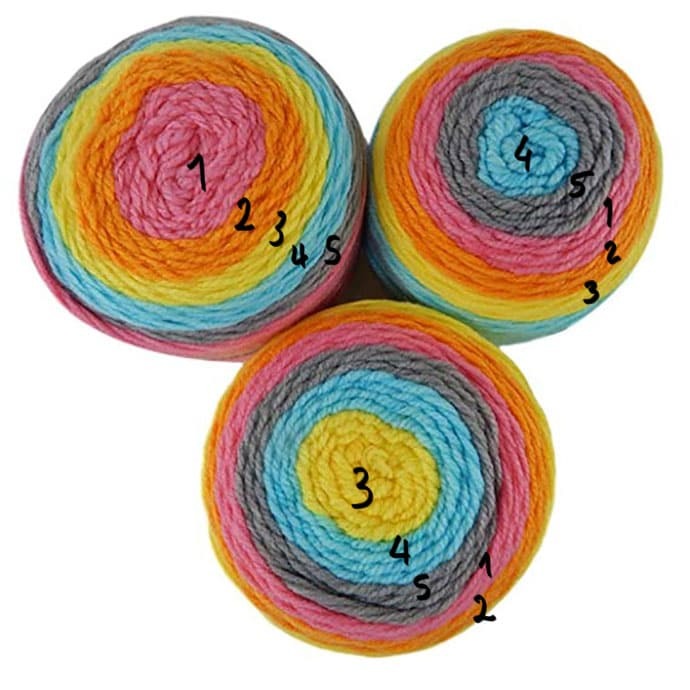 What are the advantages of using Self-Striping yarn cakes over multiple balls of regular yarn? 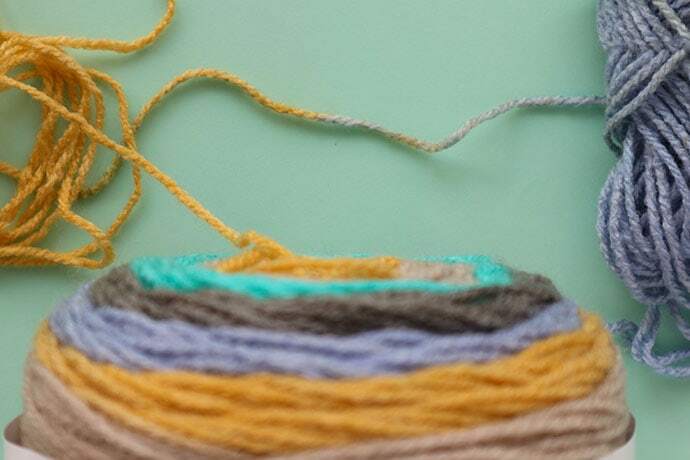 The beauty of using self-striping yarn cakes is that you get 3, 5 or more colours of yarn in one ball which saves on purchasing multiple balls of yarn for one colourful project. 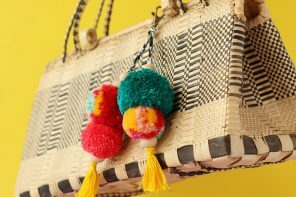 Most yarn cakes tend to be quite large so one ball goes a long way and may be enough for small projects making them very economical. The colours usually work nicely together because they’ve been selected by a yarn designer, so it saves on guess-work if you aren’t confident choosing colours. Because the colours change seamlessly there are no pesky yarn ends to weave in which is great for saving time. You can also get some great effects on projects that take advantage of striping yarn colour changes. What are the disadvantages of using Self-Striping yarn cakes? The main issue that many crafters have with self-striping yarn cakes is that you have no control over the colour changes. Depending on your project pattern, the changes may fall somewhere that doesn’t look very attractive. If you are a ‘control freak’ or are after a particular colour pattern, this lack of control may bother you. You can get around this by breaking the yarn and changing colours where it suits you. 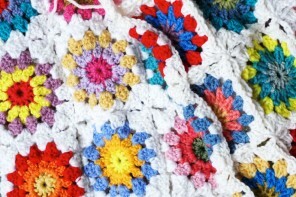 Some crafters have ‘deconstructed’ yarn cakes to have more control over the colour changes. Not every pattern look good in self-striping yarn. It’s a good idea to do some research on a yarn/pattern combination before you jump in. 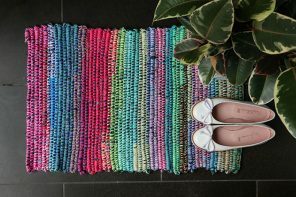 If you find it difficult to visualise what your finished project may look like, pop over to Ravelry and see if anyone has made a similar project in your chosen self-striping yarn cake. If in doubt, choose a pattern designed for self-striping yarns. 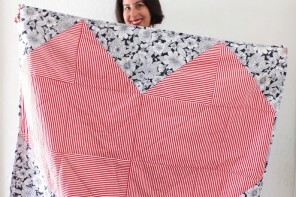 I’ll be adding a suggested pattern roundup at the end of this post. 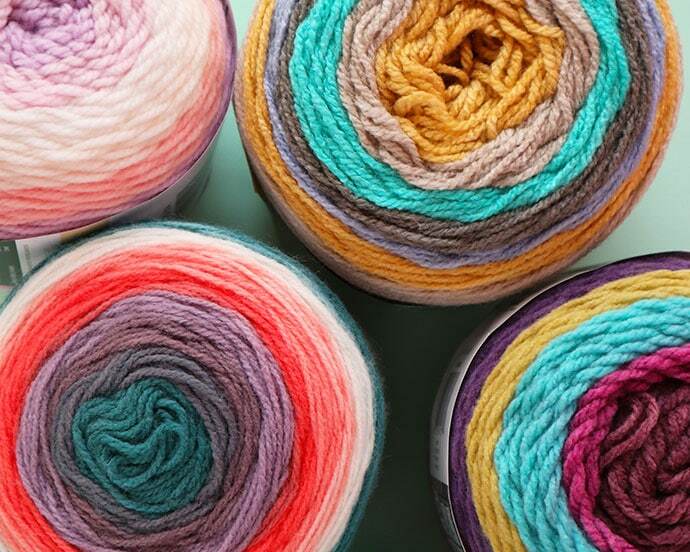 Which Self-Striping yarn cake is the best? 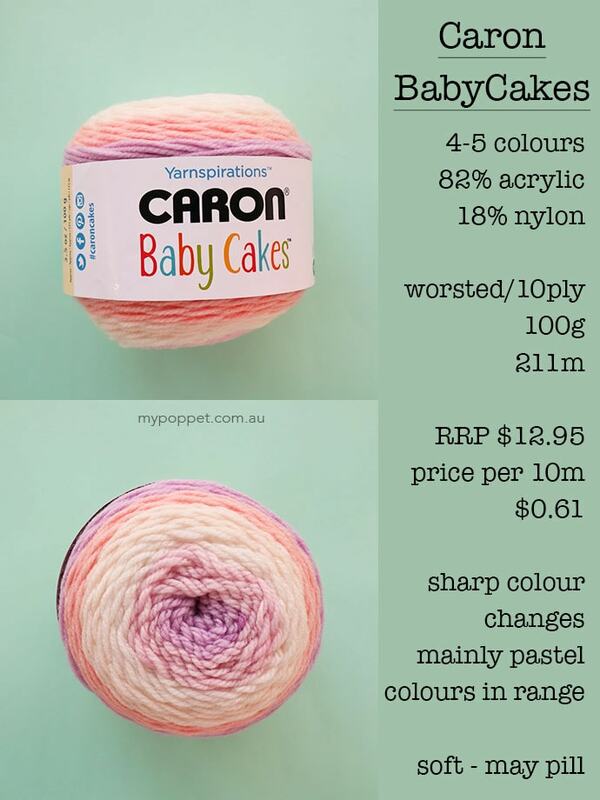 So now that I’ve covered that basic questions, let’s get to the nitty-gritty and compare some yarn cakes! 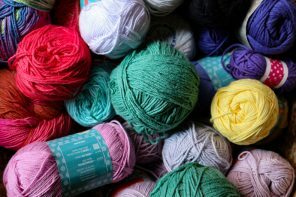 As all reviews are subjective, I’ve tried to include as much factual information to help you make your own decision for the yarn that is most appropriate for your project, as well as my own opinions and personal preferences. I’ll feature each yarn separately with my Pros and Cons of each one, and then round-up my opinion on which one I prefer at the end. Firstly let’s compare all the cakes to each other so you can see the differences in sizes and yarn thickness. As you can see, Caron Cakes are the largest ball at 200g. Bernat Pop looks about the same size, but it’s actually a smaller ball at 140g, the loftiness of the yarn makes it appear bigger. Mandala yarn is noticeable thinner as it’s a DK/8ply yarn as opposed to all the others which are worsted/10ply. You’ll also notice how the colours change through the yarn. It’s interesting to note that some colours appear more than once in the ball and this can vary depending on how the ball is wound. Most balls will start and finish with the same colour which is ideal for projects like infinity scarves, or if you are joining multiple balls. Just Note – Not all balls in the same colourway will start with the same colour. 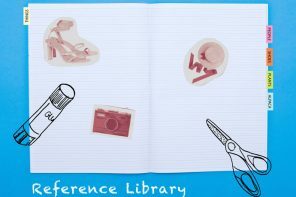 This can make a big difference to the final look of your project. 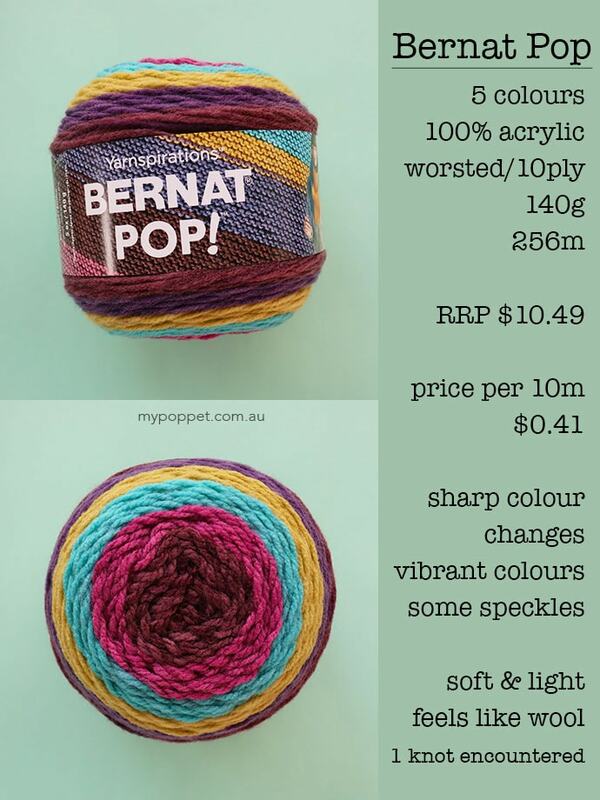 As you can see from the image below this one colourway of yarn (Bernat Pop, Pop Art) looks very different depending on the starting colour as the ball is wound. This may not make a difference to you if you only need one ball for a small project, but if you are buying multiple balls for say a blanket with a regular striping pattern, it’s important to choose balls that roughly have the same colour pattern layout. That’s easy enough to do if you are purchasing in-store but online it’s much harder to choose. 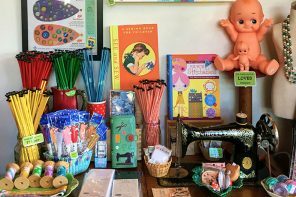 Luckily the folks at American Yarns are really lovely and hand-pick each individual order, so can accommodate a special request if required – just send them an email after your order is placed. 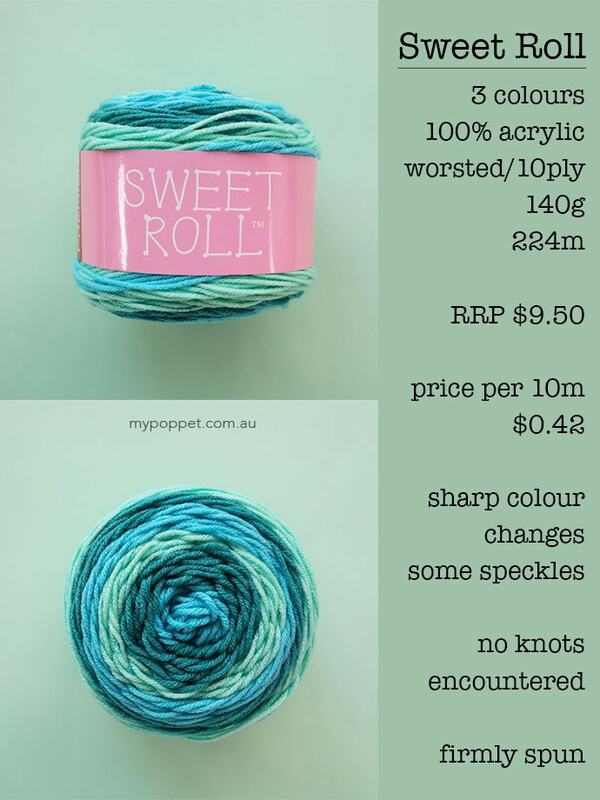 The prices listed below are a guide and are taken from the American Yarns website – current as of Sept 2018. 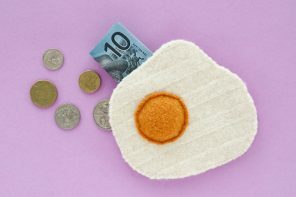 Due to AUS/US dollar currency fluctuations, sometimes the prices may vary slightly. 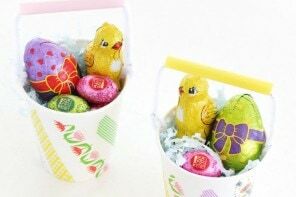 Prices quoted are in Australian dollars. 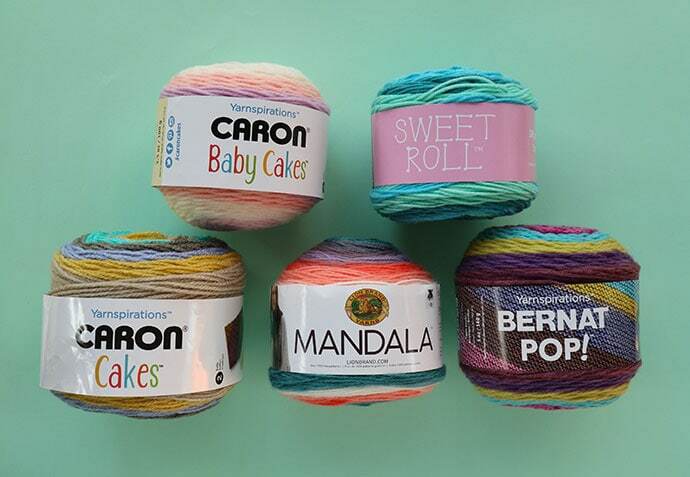 Caron is the brand that started the whole self-striping yarn cake phenomenon with many other companies bringing out their own versions soon after. Looks and feels most ‘synthetic’ of all the yarns – has a sheen which I’m not a fan of. 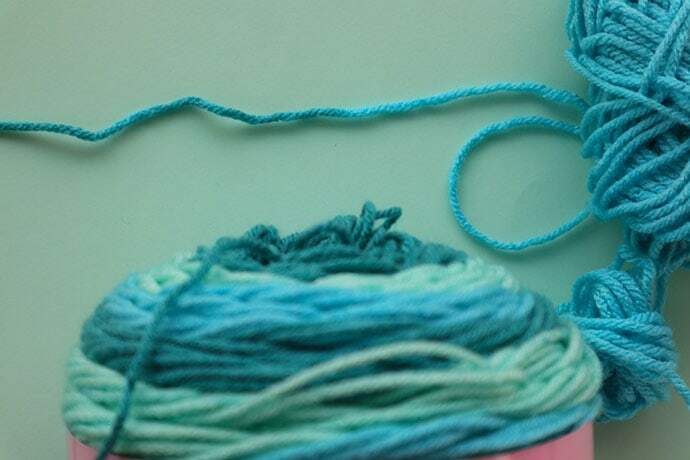 Crafters complain of knots – I have encountered knots in this yarn in the past, but interestingly the ball pictured did not have any. Caron Cakes is best suited to big projects where you want to minimise the amount of balls used to cut down on weaving in ends. Projects where you want long colour changes or smaller projects that can be completed with one large Caron cake ball. I’m not a huge fan of the texture of Caron Cakes as it feels a little too ‘acrylic-y’ to me, even though it contains wool. It’s still a nice yarn but not my first choice if other options are available. This yarn is designed for baby garments and nursery projects. The ball is half the size of the original Caron Cake. Caron Cakes is best suited to baby garments and blankets. This yarn is so squishy and feels wonderful, I wish it came in non-pastel colour options. 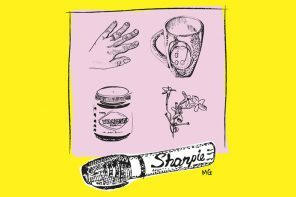 Good for small projects like hats and cardigans. I think making a large blanket from this would get quite expensive and for a similar price I’d probably opt for a machine washable baby merino. Another yarn cake with vibrant colour changes. Lovely soft textured yarn that is slightly thicker and loftier than Caron cakes yarn. 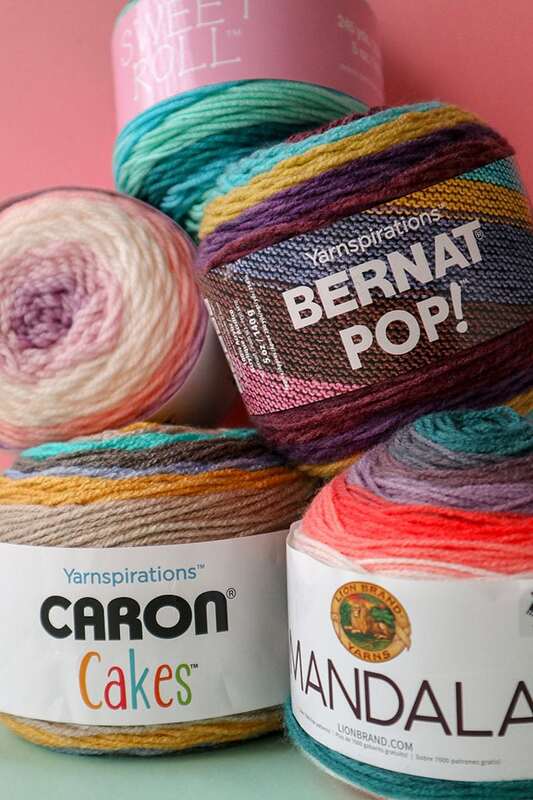 Bernat Pop is best suited to any project that calls for worsted self-striping yarn. 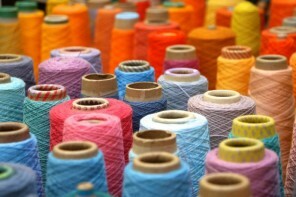 Yarn feels very durable and would be suitable for blankets, garments, homewares and toys. I love this yarn and can’t wait to make lots of projects from it. The colour combinations available are really nice with a good choice of neutrals and vibrant colours. This yarn is a great all-rounder for knitting and crochet projects. The yarn feels soft and could be mistaken for wool. 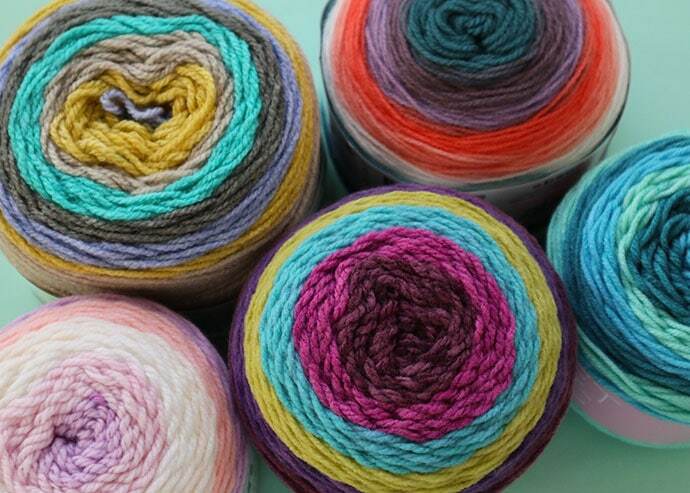 The perfect acrylic yarn for those that are synthetic adverse. 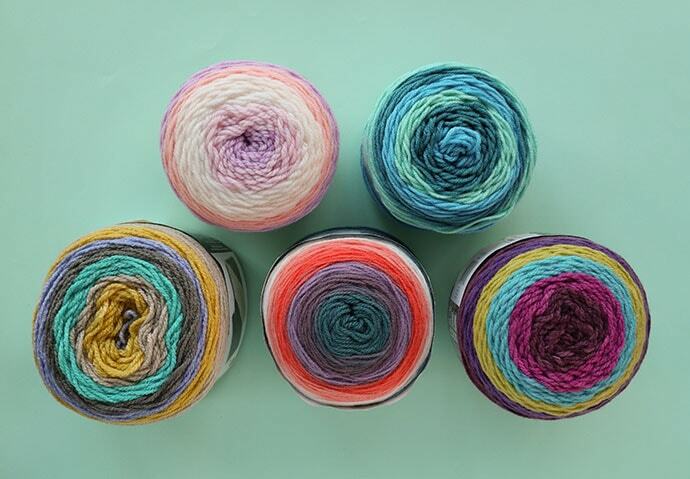 Hot on the heels of Caron Cakes, Sweet Roll was the second cake yarn to come on the market. The main difference to all the other yarns is that it has only 3 colours repeated twice. Sweet Roll is best suited to any project that calls for worsted self-striping yarn. Yarn feels very durable and would be suitable for blankets, garments, homewares and toys. Choose this yarn if you want shorter stripes that repeat. I love this yarn and enjoy crocheting with it as it has great stitch definition. Especially suited to projects that may be washed a lot. A great all-rounder! 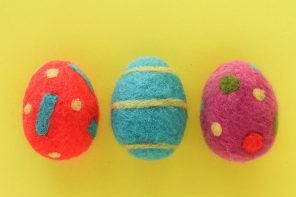 The smaller balls means you need to buy more balls depending on the project, but its a good opportunity to mix a few different colourways together for a multi-coloured effect. 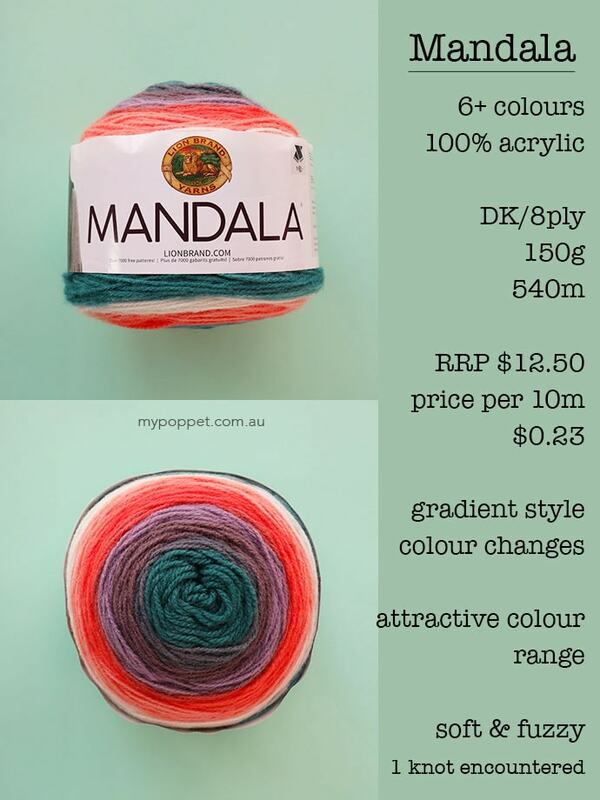 Mandala is best suited to garment projects that require a lighter weight yarn. Perfect for shawls that show off the gradient effect. This yarn is just beautiful and looks and feels like a much more premium/expensive yarn. 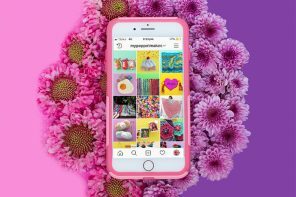 The gradient effect is really gorgeous and I’m inspired to create lots of projects that show it to full effect. The ball meterage is huge which makes it great value. Mandala – because of the beautiful gradient effect and great value. 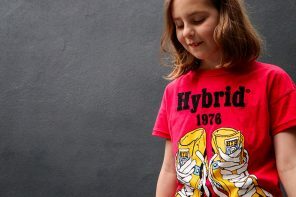 Bernat Pop – soft and versatile. Sweet Roll – a great all-rounder for projects that expect hard wear. Not all patterns show off self-striping yarn to best effect and I often get asked questions as to the best patterns and projects to make with yarn cakes. I’m planning on creating some original cake yarn patterns down the track, but for now I’ve scoured the internet for some of my favourites. 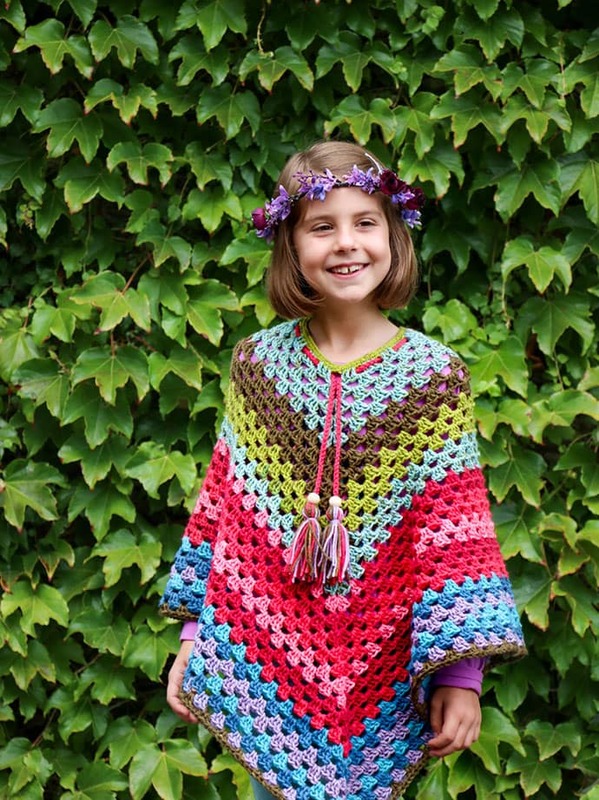 I’ve included both crochet and knitting patterns in this roundup. Some use just one ball which is ideal if you have a yarn cake sitting around and don’t know what to do with it. 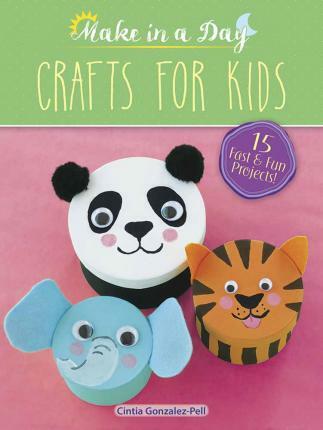 There are a few bigger projects in there too, for when you’ve caught the yarn cake bug! The patterns I’ve chosen use the yarn cake without breaking, but if you like more control as to where colour changes fall, of course you can cut the yarn and re-join. Oh and best of all, all these patterns are FREE! 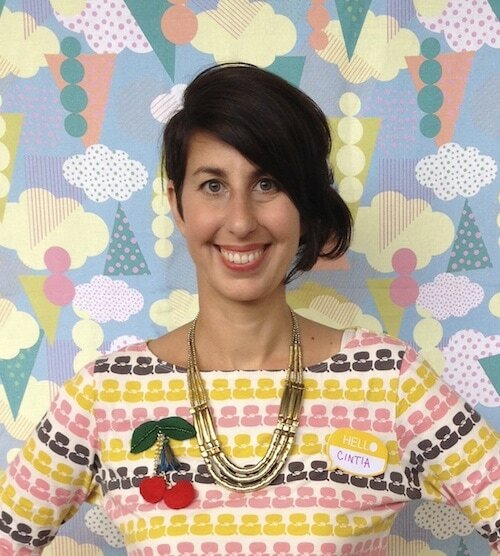 I hope you get some inspiration for your next self-striping yarn cake project. 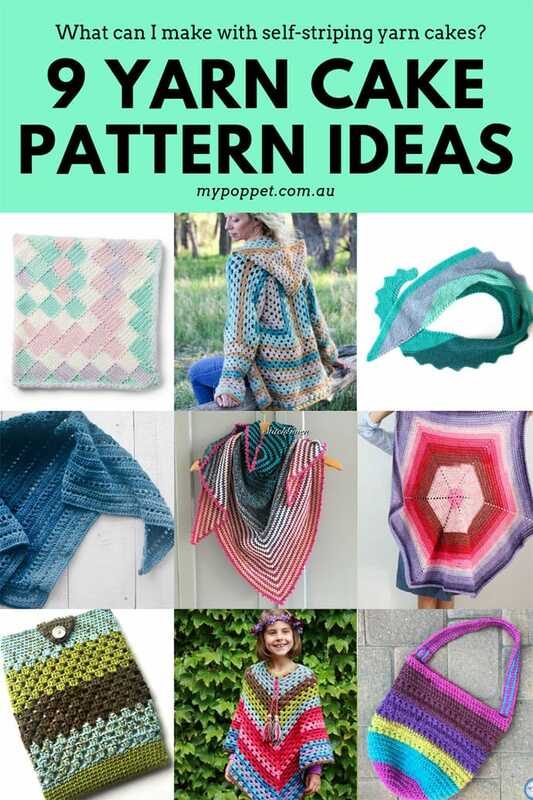 What to make with yarn cakes – Here are some great knitting and crochet patterns. Glad you found it helpful. 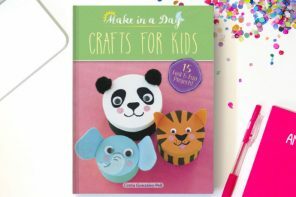 I’d love to see what you make with one. I’m so glad you did this review, I totally agree with your opinion of the Caron cakes, I really didn’t like it at all. I did a small sleeveless jacket for my granddaughter in a spotlight brand cake as it was much nicer than the Caron, which was the only alternative at the time. Came out great! 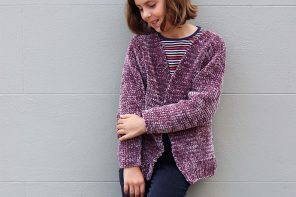 I’ve also made a campfire cardigan, though not in cakes yarn. It’s a great pattern as it can be adjusted to fit anyone. I actually did mine in 4 ply baby wool to fit a 1 yr old. Brilliant! I love the attention to detail which makes this post a great reference. Thank you for putting in all that work. Thanks Jodie, I’m glad you found it useful. Very very helpful. Just the information I needed.